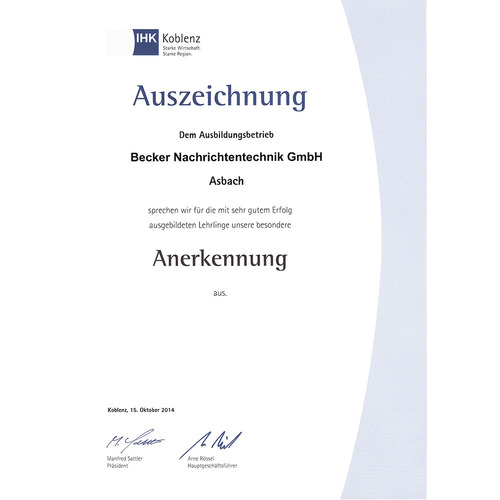 As a company in the field of radio frequency technology, Becker Nachrichtentechnik GmbH offers an entry point in a future-oriented field of expertise. In our Team you will be able to deploy your expertise in a challenging discipline. Join our Team, create new ideas and help us devolp products and systems from the very beginnings to the finished soultion. We are currently searching for electronics technicians specialized in devices and systems for the expansion of our professional team. Abgeschlossener Studiengang zum Bachelor oder Master der Informationstechnik. Teamfähigkeit, zielorientiertes Arbeiten an herausfordernden Aufgaben und Zuverlässigkeit. Die Mitarbeit in einem innovativen Unternehmen mit interessanten Aufgabenbereichen im Bereich der Drahtlosen Kommunikationstechnik bei guter Bezahlung. During the three and a half years of education, the electronics technican for devices and systems learns how to produce and check electronic assemblies and devices. He supports the development and construction and helps manufacturing our products. He will get to know the following departments: Hardware developement, software developement, construction, production and quality check.